Bayeux is only 35 minutes from our B&B and holiday accommodation. Home to the world famous Bayeux tapestry, this lovely town is certainly one of our favourite places in this beautiful area of Normandy. Bayeux offers the visitor an array of fantastic shops, restaurants and bars, as well as many historic places to visit. 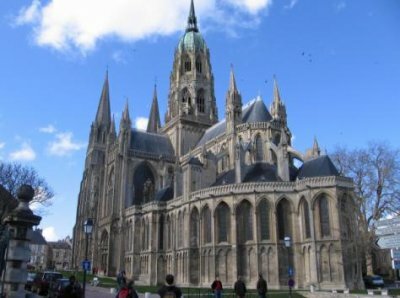 The most notable feature of this wonderful city, is the Bayeux Cathedral. Built in 1077, this magnificent cathedral towers above the city with grace and beauty. Nearly a thousand years since it’s construction, visitors are still in awe of it’s architectural genius. The catherdral continues to attract thousands of visitors each year. The Bayeux Tapestry which depicts the Norman Invasion of England by William, the Duke of Normandy; better known as William the Conqueror. He invaded England in 1066 with his Norman army. The story of the Battle of Hastings was embroided onto a 70 metre long tapestry; this is universally known as the Bayeux Tapestry. The Bayeux Tapestry is listed by UNESCO and orginally dates back to the 11th century. There a number of replicas of the Bayeux Tapestry; however, the original, constructed in the 11th century, is located in Bayeux and is a major tourist attraction. During World War 2, Bayeux was virtually unscathed by German and Allied fighting. During the D-Day invasion in June 1944, the majority of the German troops in and around Bayeux were redeployed to the neighbouring city of Caen. Caen was deemed a more strategic point by the German’s, so their forces pulled out. Thanks to this action by the German’s, Bayeux remains as it has been for hundreds of years. The historic architecture of this city gives you the impression that you have gone back in time. Despite not witnessing the battles of that at Caen, Bayeux is still steeped in World War 2 history. 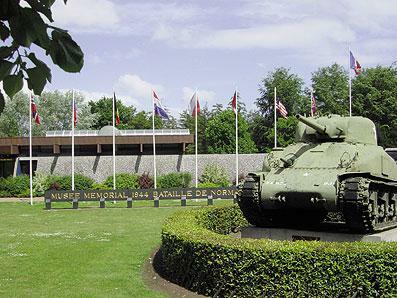 The Bayeux D-Day Museum houses an impressive collection of authentic equipment used during the invasion. Outside the museum, there are allied and German tanks waiting to greet visitors. The Bayeux D-Day Museum was created in 1984 and it tells the story of the allied invasion of Normandy in 1944; from the conception of operation Overlord to the allied landings on June 6th. 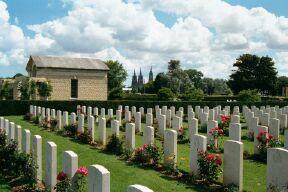 Located across the road from the D-Day museum, is the Bayeux British War Cemetery. There are around 4000 graves of the soldiers from the British Commonwealth who lost their lives during the Normandy invasion. Photographers and journalists who lost their lives during the invasion are also remembered here. There are numerous places to stay in and around Bayeux. If you are looking for bed and breakfast accommodation and do not have a car, we suggest staying in the centre of the town. There are a few B&B’s just outside the train station and are reasonably priced. If you have a car and would like to explore the surrounding areas, why not stay with us at Ivy House. Our B&B is just over 30 minutes from Bayeux and we have the added benefit of being located next to the beach. Have the best of all worlds and visit the town and then come have a peaceful stay with us in wonderful Normandy countryside.